Perstorp, a Sweden-based world leader in speciality chemicals, reports the GCC market has seen over the past three years double-digit growth in the imports of the company’s essential building blocks for intumescent paints and single-digit growth in the imports of its products for decorative and industrial coatings. It announced it is strengthening its regional hub in Dubai for the Middle East and Africa with local sales expertise that will help further growth. The company reports strong sales in the GCC region of its key raw materials for powder coatings, unsaturated polyesters and gel coats as well as coalescent agents for acrylic decorative paints. “Perstorp sales of its trademarked Charmor additive products for halogen-free fire resistant so called intumescent paints have shown very strong growth in recent years,” says Bo Häggman, vice president, sales, specialties and solutions, Perstorp AB, Sweden. Those sales will further be augmented with booming infrastructure projects for the upcoming World Expo in Dubai and Soccer World Cup in Qatar, Häggman added. Discussing new products, the official said the company has been very successful with introducing its Charmor brand for intumescent coatings and is seeing strong growth at present. 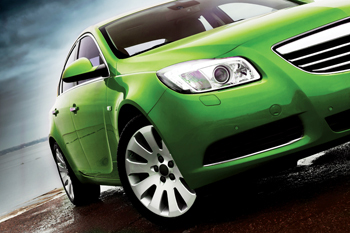 The next product line to develop is the Capa brand for polyurethane coatings. Buyers of Perstorp products are a combination of strong multinationals that grow in the region but also locally strong Middle East-based coating companies that are investing in new technology and innovation and would like to team up with leading global companies such as Perstorp. “The key to success is a combination of strong partnerships, local presence and value propositions that match the needs for the region. Our regional hub for Middle East and Africa is Dubai and we are strengthening the local office with local sales expertise that will help us to grow further in the future,” said Häggman. Perstorp has approximately 1,500 employees and manufacturing units in Asia, Europe and North Africa. The company presented its advanced solutions and building blocks for coatings at the Middle East Coatings Show 2014. 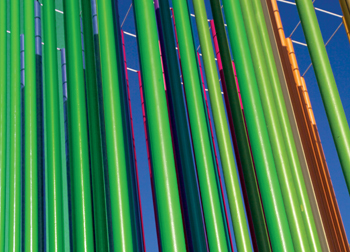 The strong regional interest for fire-protected infrastructure and buildings is growing the demand for intumescent coatings. Perstorp already has a strong position in the Middle East and Africa region with the Charmor range, which provides the critical halogen-free char component in intumescent coatings. Demand from the petrochemical industry for infrastructure protection, such as chemical and UV resistant coatings for piping, is also growing significantly. Perstorp’s caprolactone range, Capa, is well positioned to take advantage of this growth by providing coating systems with high performance properties to match the tough environmental demands. 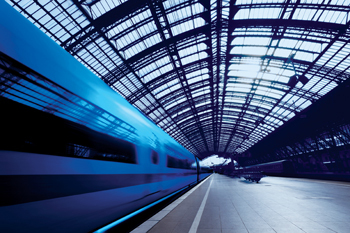 Capa Polyols 3050 and 3090 for low VOC polyurethane coatings provide outstanding chemical, UV and abrasion resistance for industrial coatings. With increased regional interest in finding more sustainable solutions. Perstorp devotes over 80 per cent of R&D expenditure to finding more sustainable solutions. 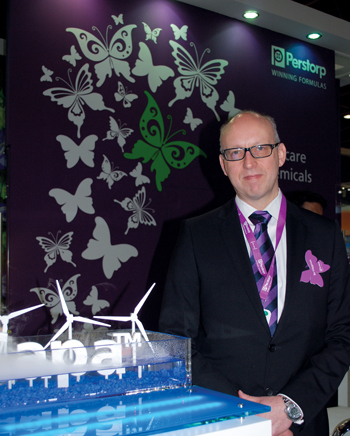 Middle East Coatings Show 2014 was a perfect platform for Perstorp to highlight its strong position in the region as well as its unique blend of “commitment with care” to the customers. The company presented several innovative high performance products such as the trademarked Capa, Charmor and Voxtar Penta that contribute significantly towards more sustainable coating solutions and products.